Hi! I'm a resident of Riverbend. Riverbend is a rapidly growing community on the North side of the city of Winnipeg. And I have a problem. A serious one that my ward councellor Devi Sharma, my city, nor the 7 Oaks School Division are willing to address. It's a safety issue that affects many of us in the area. 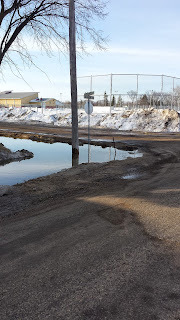 In Riverbend, Donan Street is a direct route from Murray Avenue to the elementary school on Red River Blvd. In all of the city's infrastructure brilliance there is only a sidewalk halfway up the very long street. From Murry Avenue to Park Manor Blvd, spring through fall, parents, children and other area residents dodge vehicles and large school buses, often jumping into ditches on the narrow stretch. On garbage day, with the new bins, the trip can resemble a large game of freeze tag. Impatient drivers too often try to drive around an "idling" car into oncoming traffic with a parent and child(ren) caught in the middle and nowhere to go. In the winter, the road conditions are downright deadly. Plowing, when it gets done, leave high snow piles that fill in ditches and scattered driveways are the only sanctuary. 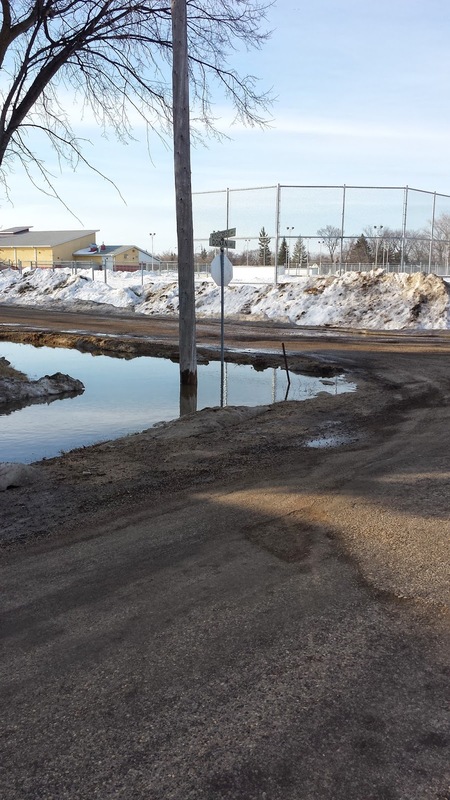 Winnipeg city also sands as little as possible, which means Donan is almost always a sheet of ice presenting an even bigger danger for your children who behave like deer in headlights when put in a scary situation. They run toward the oncoming vehicle, not away, as they don't have the experience or maturity to know better yet. In the last five years alone, traffic has increased substantially on Donan. Our schools are bursting at the seams and a new school is being built, the sidewalk is still not being addressed. They want the children to use Swinford Way, which comes with its own problems. Just look at the way the streets and stop signs are set up. This is no more safe, than the most logical route; down Donan Street. My children want desperately to walk to school on their own, a right of passage back in our day, but I can't let them because one misstep and they will be renaming the street E___ Memorial Way. How could I even think about my child dying and naming a street after him? How could I not? I would be foolish to think only someone else's child could die, not mine. Being a mother how could I not advocate for all children? But that is how our city thinks. That's why they "grandfathered" Donan out when Riverbend expanded. Devi Sharma has done nothing either. She suggests more people should walk. Please Ms. Sharma, you walk the daily trip with your children and tell me how safe you feel? And walk it in winter. She also says adding in a sidewalk (even on one side), will up our taxes and she doesn't want to do that. Well guess what Ms. Sharma, our taxes are being raised yearly, and yet somehow are services continue to decline. Why are my taxes paying for infrastructure on Rapid Trasit on the opposite side of the city? A service I will never use based on location alone? Now at the top of Main Street and Murray Avenue they are building a Dollarama, add the new school and a new apartment complex going up behind the Dollarama (all around the busy community club), and your traffic just tripled in the three block radius with no sidewalk. Somebody please tell me and other parents how a sidewalk is not a main priority? Explain to us why at meetings we are continually told that the city isn't repsonsible for the sidewalk, and neither is the school division. Shouldn't the safety of our children trump political bs? Somebody, tell me if these people aren't responsible who is, because I don't want to wait until another child dies before they put in a sidewalk and rename a street after a broken hearted parents child.